PORTLAND, Ore.—July 31, 2018—Resource Innovation Institute (RII), a non-profit organization establishing cannabis industry standards and incentives that drive conservation, has named Josh Munk as Cultivation Advisor. Munk has experience in a wide range of environments and cultivation practices and will leverage that knowledge to helpRII’s member growers assess and incorporate cutting-edge technologies and best management practices. Munk is working with RII to develop services, resources and tools to help cultivators become more resource efficient, lower their costs and become more competitive. He has updated RII’s membership packages to help growers maximize profits in this challenging business environment through bulk purchasing discounts, so cultivators can reinvest in more efficient techniques and technologies. Munk will serve as the Institute’s grower representative to utilities and other stakeholders. As event facilitator, he will lead RII’s robust calendar of grower-led workshops providing actionable tactics that help cultivators get more from their bottom line. Local environmental and site conditions can cause extreme temperature and humidity fluctuations that can have a detrimental impact on cannabis product value. With energy and resource expenditures sometimes commanding up to 50 percent of operating costs, facility inefficiencies can make or break a cannabis operator’s profit margins. Combined with dropping prices, these inefficiencies are massive roadblocks to success. To combat these issues, RII works with industry leaders to advance techniques and technologies that drive quality production while lowering resource expenses. Growing up on a pear orchard, Munk has always been fascinated by agriculture and horticulture.Munk is the founder of Nexus Consulting, where he offers consulting on all aspects of facility acquisition / design / build, production, cultivation and best management practices. 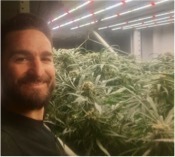 He has built and operated commercial outdoor and greenhouse grows, and one of the first vertical LED facilities on the West Coast. That facility—Master Gardens in Portland, Oregon—was completed in 2013 as a “showroom grow room,” designed to showcase new technologies and best management practices, educating industry professionals and helping the industry move toward increased sustainability and optimized efficiencies. Munk has been active as a board member of the Oregon Cannabis Association and the Oregon Cannabis PAC. A cannabis advocate since the mid-1990s, Munk was among the first in Oregon to get a medical card. He graduated from Oregon State University with a degree in Natural Resources and a minor in horticulture. RII members receive several benefits such as discounts through an exclusive RII-affiliated group purchasing network and resources to advance cultivators’ craft. Members also have access to RII’s network of leading cultivators, operators, facility designers, manufacturers and utilities who are exchanging best practices on energy, water and profitable production.